Reported net income applicable to common stock of $196 million, or $1.29 per diluted share, for 2008, compared to $686 million, or $4.43 per diluted share, for 2007, as 2008 was met with an increasingly difficult economic environment, including turmoil in the financial markets, declining home values and rising unemployment rates. The most significant items contributing to the decrease in net income applicable to common stock were an increase in the provision for credit losses of $493 million, a decrease in net interest income of $188 million, an $88 million net charge related to the Corporation's repurchase of certain auction-rate securities held by customers and $34 million of 2008 severance-related expenses. These were partially offset by a $60 million increase in net securities gains. Average loans in 2008 were $51.8 billion, an increase of $1.9 billion from 2007. By geographic market, Texas average loans grew 14 percent and Florida average loans grew 13 percent from 2007 to 2008, compared to lower growth in the Midwest (three percent), Western (less than one percent) and International (six percent) markets. Average Financial Services Division loans declined $820 million. Net interest income declined $188 million to $1.8 billion in 2008, compared to 2007. The net interest margin decreased 64 basis points to 3.02 percent, primarily due to a decrease in loan portfolio yields and a reduced contribution from noninterest-bearing funds in a significantly lower rate environment, changes in the mix of earning assets, driven by growth in the investment securities portfolio, and interest-bearing sources of funds, and $38 million of tax-related non-cash charges to lease income in 2008. 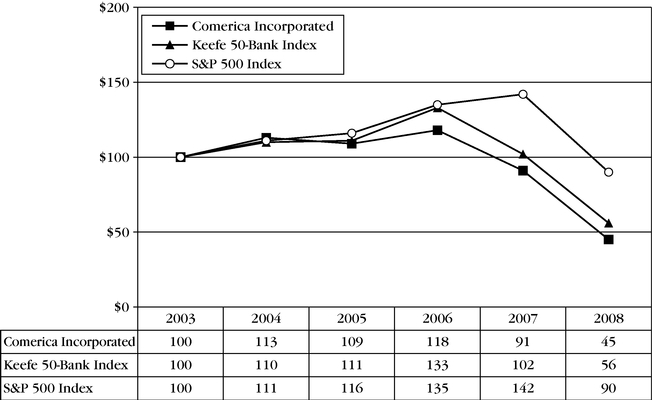 Noninterest income increased less than one percent compared to 2007, largely due to securities gains realized on the sale of the Corporation's ownership of Visa, Inc. (Visa) ($48 million) and MasterCard shares ($14 million) in 2008, offset by decreases in deferred compensation asset returns (offset by decreased deferred compensation plan costs in noninterest expenses) ($33 million) and net losses from principal investing and warrants ($29 million). Service charges on deposit accounts, letter of credit fees and card fees showed solid growth in 2008. Noninterest expenses increased $60 million, or four percent, compared to 2007, primarily due to an $88 million net charge in 2008 related to the repurchase of auction-rate securities and increases in severance-related expenses ($30 million), the provision for credit losses on lending-related commitments ($19 million) and net occupancy expense ($18 million), partially offset by decreases in salaries, excluding severance ($88 million) which included a decrease in deferred compensation plan costs ($33 million), and customer services expense ($30 million). Full-time equivalent employees decreased six percent from year-end 2007 to year-end 2008, even with the addition of 28 new banking centers during the period. Incurred net after-tax charges of $9 million in the provision for income taxes reflecting settlements with the Internal Revenue Service on various structured transactions and other tax adjustments. Experienced net credit-related charge-offs of 91 basis points as a percent of average total loans in 2008, compared to 31 basis points in 2007. Excluding Commercial Real Estate, net credit-related charge-offs were 46 basis points of average loans in 2008, compare to 20 basis points in 2007. Nonperforming assets increased to $983 million, reflecting challenges in the residential real estate development business located in the Western market (primarily California) and to a lesser extent in the Middle Market business line. To preserve and enhance the Corporation's balance sheet strength in this uncertain economic environment, the Corporation lowered the quarterly cash dividend rate by 50 percent in the fourth quarter 2008 to $0.33 per share. Implemented a loan optimization plan in mid-2008 with the goal of increasing loan spreads and enhancing customer relationship returns. Focused significant resources on managing deteriorating credit quality in 2008, particularly in the commercial real estate portfolio. Continued organic growth focused in high growth markets, including opening 28 new banking centers in 2008. The Corporation expects to open new banking centers in 2009 in our growth markets of California, Texas and Arizona; however, significantly fewer compared to 2008. Since the banking center expansion program began in late 2004, new banking centers have resulted in nearly $1.9 billion in new deposits. Reduced full-time equivalent staff by six percent in 2008, even with 135 full-time equivalent employees added to support new banking center openings. Management expects to reduce the workforce by an additional five percent, largely to be completed in the first quarter 2009. Reduced automotive production-related exposure from loans, unused commitments and standby letters of credit and financial guarantees from $3.7 billion at December 31, 2007 to $2.9 billion at December 31, 2008. Total automotive net loan charge-offs were $6 million in 2008. Purchased approximately $2.9 billion of AAA-rated mortgage-backed securities issued by government-sponsored entities in 2008 to reduce interest rate sensitivity. Increased average noninterest-bearing deposits $529 million, or six percent, in 2008, excluding the Financial Services Division. Repurchased, at par, auction-rate-securities held by certain retail and institutional clients to ensure impacted customers were provided with a liquidity solution. Enhanced capital ratios by issuing $2.25 billion of Tier 1 capital in the form of 2.25 million shares of preferred stock and a related warrant under the U.S. Department of Treasury Capital Purchase Program, implementing a loan optimization program, strict expense controls and lowering the quarterly dividend. The Tier 1 common capital and Tier 1 capital ratios were 7.08 percent and 10.66 percent, respectively, at December 31, 2008, up from 6.85 percent and 7.51 percent, respectively, at December 31, 2007. Reduced the quarterly cash dividend to $0.05 per share in the first quarter of 2009, to preserve capital. The accounting and reporting policies of the Corporation and its subsidiaries conform to U.S. generally accepted accounting principles and prevailing practices within the banking industry. The Corporation's consolidated financial statements are prepared based on the application of accounting policies, the most significant of which are described in Note 1 to the consolidated financial statements. The most critical of these significant accounting policies are discussed in the "Critical Accounting Policies" section of this financial review. As a financial institution, the Corporation's principal activity is lending to and accepting deposits from businesses and individuals. The primary source of revenue is net interest income, which is derived principally from the difference between interest earned on loans and investment securities and interest paid on deposits and other funding sources. The Corporation also provides other products and services that meet the financial needs of customers and which generate noninterest income, the Corporation's secondary source of revenue. Growth in loans, deposits and noninterest income is affected by many factors, including the economic growth in the markets the Corporation serves, the financial requirements and health of customers and successfully adding new customers and/or increasing the number of products used by current customers. Success in providing products and services depends on the financial needs of customers and the types of products desired. The Corporation sold its stake in Munder Capital Management (Munder) in 2006. This financial review and the consolidated financial statements reflect Munder as a discontinued operation in all periods presented. For detailed information concerning the sale of Munder and the components of discontinued operations, refer to Note 27 to the consolidated financial statements. The remaining discussion and analysis of the Corporation's results of operations is based on results from continuing operations. Average loans in 2008 increased $1.9 billion, or four percent, from average 2007 levels. Excluding the Financial Services Division, average loans grew $2.8 billion, or six percent, in 2008, compared to 2007, with growth in most business lines, including Global Corporate Banking (18 percent), Specialty Businesses, which includes Entertainment, Energy, Leasing, Technology and Life Sciences, (14 percent) and Private Banking (15 percent). Excluding the Financial Services Division, average loans grew in all geographic markets in 2008, compared to 2007: Texas (14 percent), Western (six percent), Midwest (three percent), Florida (13 percent) and International (six percent). Average deposits, excluding the Financial Services Division increased $1.5 billion, or four percent from 2007, resulting primarily from an increase in other time deposits. Excluding the Financial Services Division, average noninterest-bearing deposits increased $529 million, or six percent, in 2008, compared to 2007. In the Financial Services Division, where customers deposit large balances (primarily noninterest-bearing) and the Corporation pays certain expenses on behalf of such customers and/or makes low-rate loans to such customers, average loans decreased $820 million, or 62 percent, in 2008. Average Financial Services Division deposits decreased $1.4 billion, or 36 percent, in 2008, compared to 2007, as average noninterest-bearing deposits decreased $1.2 billion and average interest-bearing deposits decreased $245 million due to reduced home prices, as well as, lower home mortgage financing and refinancing activity. Net interest income decreased nine percent in 2008, compared to 2007, primarily due to a decrease in loan portfolio yields and a reduced contribution from noninterest-bearing funds in a significantly low interest rate environment, a challenging deposit pricing environment, the impact of a higher level of nonaccrual loans and $38 million of tax-related non-cash charges to lease income in 2008, partially offset by growth in average earning assets, largely driven by growth in investment securities available-for-sale. SBA loans ($9 million) and commercial lending fees ($6 million). Changes in deferred compensation asset returns are offset by changes in deferred compensation plan costs in noninterest expenses. The Corporation's credit staff closely monitors the financial health of lending customers in order to assess ability to repay and to adequately provide for expected losses. Loan quality was impacted by challenges in the residential real estate development business in the Western market (primarily California) and to a lesser extent in the Middle Market and Small Business loan portfolios. Negative credit quality trends resulted in an increase in net credit-related charge-offs and nonperforming assets in 2008, compared to 2007. Noninterest expenses increased four percent in 2008, compared to 2007, primarily due to an $88 million net charge related to the repurchase of auction-rate securities and increases in severance-related expenses ($30 million), the provision for credit losses on lending-related commitments ($19 million) and net occupancy expense ($18 million), partially offset by decreases in salaries, excluding severance ($88 million) which included a decrease in deferred compensation plan costs ($33 million), and customer services expense ($30 million). The increase in net occupancy expense in 2008 included $10 million from the addition of 28 new banking centers in 2008 and 30 new banking centers in 2007. The refinement in the application of SFAS No. 91, "Accounting for Loan Origination Fees and Costs," (SFAS 91), as described in Note 1 to the consolidated financial statements, resulted in a $44 million reduction in salaries expense for the year 2008, compared to 2007. Full-time equivalent employees decreased six percent (approximately 600 employees) from year-end 2007 to year-end 2008, even with 135 full-time equivalent employees added to support new banking center openings. Over 50 percent of the Corporation's revenues are generated by the Business Bank business segment, making the Corporation highly sensitive to changes in the business environment in its primary geographic markets. To facilitate better balance among business segments and geographic markets, the Corporation opened 28 new banking centers in 2008 in markets with favorable demographics and plans to continue banking center expansion in these markets. This is expected to provide opportunity for growth across all business segments, especially in the Retail Bank and Wealth & Institutional Management segments, as the Corporation penetrates existing relationships through cross-selling and develops new relationships. Management expects to focus on new and expanding relationships, particularly in Small Business, Middle Market and Wealth Management with the appropriate pricing and credit standards. Management expects full-year net interest margin pressure will continue. Management anticipates no change in the Federal Funds rate. Management also expects continued improvement in loan spreads, challenging deposit pricing and demand deposits that provide less value in a historically low interest rate environment. Based on no significant further deterioration of the economic environment, management expects full-year net credit-related charge-offs to remain consistent with full-year 2008. The provision for credit losses is expected to continue to exceed net charge-offs. Management expects a mid-single digit decrease in noninterest expenses, due to control of discretionary expenses and workforce. On February 17, 2009, the American Recovery and Reinvestment Act of 2009 (the Act) was signed into law. The Act amended certain provisions of the U.S. Department of the Treasury Capital Purchase Program (the Purchase Program) described in the Capital section of this financial review and Note 12 to the consolidated financial statements. The Act included a provision that requires the Secretary of the U.S. Treasury to establish standards to limit executive compensation and certain corporate expenditures for all current and future participants in the Purchase Program. As a Purchase Program participant, the Corporation is subject to any such standards established by the Secretary of the U.S. Treasury. The Act also amended the Purchase Program to allow participants, with regulatory approval, to redeem preferred shares issued to the U.S. Treasury with funds other than those raised through a "qualified equity offering" as described in Note 12 to the consolidated financial statements. Upon redemption of the preferred shares, the Secretary of the U.S. Treasury shall liquidate all warrants issued in connection with such preferred shares at the then current fair value per share. The Corporation is currently evaluating the impact of the Act on executive compensation and certain corporate expenditures and the redemption of the preferred shares. 2008 net interest income declined $38 million and the net interest margin declined six basis points due to tax-related non-cash lease income charges. Excluding these charges, the net interest margin would have been 3.08%. The gain or loss attributable to the effective portion of cash flow hedges of loans is shown in "Business loan swap income (expense)". The gain or loss attributable to the effective portion of fair value hedges of medium- and long-term debt, which totaled a net gain of $43 million in 2008, is included in the related interest expense line item. Medium- and long-term debt average balances have been adjusted to reflect the gain or loss attributable to the risk hedged by risk management swaps that qualify as a fair value hedge. Net interest income is the difference between interest and yield-related fees earned on assets and interest paid on liabilities. Adjustments are made to the yields on tax-exempt assets in order to present tax-exempt income and fully taxable income on a comparable basis. Gains and losses related to the effective portion of risk management interest rate swaps that qualify as hedges are included with the interest income or expense of the hedged item when classified in net interest income. Net interest income on a fully taxable equivalent (FTE) basis comprised 67 percent of total revenues in 2008, compared to 69 percent in 2007 and 70 percent in 2006. Table 2 of this financial review provides an analysis of net interest income for the years ended December 31, 2008, 2007 and 2006. The rate-volume analysis in Table 3 above details the components of the change in net interest income on a FTE basis for 2008, compared to 2007, and 2007, compared to 2006. Net interest income (FTE) was $1.8 billion in 2008, a decrease of $185 million, or nine percent, from 2007. The net interest margin (FTE), which is net interest income (FTE) expressed as a percentage of average earning assets, decreased to 3.02 percent in 2008, from 3.66 percent in 2007. The decrease in net interest income in 2008 was primarily due to a decrease in loan portfolio yields and a reduced contribution from noninterest-bearing funds in a significantly lower interest rate environment, a competitive environment for deposit pricing, the impact of a higher level of nonaccrual loans and $38 million of tax-related non-cash charges to lease income in 2008, partially offset by growth in average earning assets, largely driven by growth in investment securities available-for-sale. The lease income charges reflected the reversal of previously recognized income resulting from projected changes in the timing of income tax cash flows on certain structured leasing transactions and will fully reverse over the remaining lease terms (up to 19 years). Further information about the charges can be found in the "Income Taxes and Tax-related Items" section of this financial review and Note 17 to the consolidated financial statements. The decrease in the net interest margin (FTE) resulted primarily from the reasons cited for the decline in net interest income discussed above, and as a result of the change in the mix of both earning assets, driven by growth in investment securities available-for-sale, and interest-bearing sources of funds. The 2008 lease income charges discussed above reduced the net interest margin by six basis points. Average earning assets increased $5.7 billion, or 10 percent, to $60.4 billion in 2008, compared to 2007, primarily as a result of a $3.7 billion increase in average investment securities available-for-sale and a $1.9 billion increase in average loans. Net interest income and net interest margin are impacted by the operations of the Corporation's Financial Services Division. Financial Services Division customers deposit large balances (primarily noninterest-bearing) and the Corporation pays certain expenses on behalf of such customers ("customer services" included in "noninterest expenses" on the consolidated statements of income) and/or makes low-rate loans to such customers (included in "net interest income" on the consolidated statements of income). The Financial Services Division serves title and escrow companies that facilitate residential mortgage transactions and benefits from customer deposits related to mortgage escrow balances. Financial Services Division deposit levels may change with the direction of mortgage activity changes, the desirability of such deposits and competition for deposits. Footnote (1) to Table 2 of this financial review displays average Financial Services Division loans (primarily low-rate) and deposits, with related interest income/expense and average rates. Average Financial Services Division loans (primarily low-rate) decreased $820 million, and average Financial Services Division noninterest-bearing deposits decreased $1.2 billion in 2008, compared to 2007. Footnote (2) to Table 2 of this financial review displays the impact of Financial Services Division loans on net interest margin (assuming the loans were funded by Financial Services Division noninterest-bearing deposits), which was a decrease of one basis point in 2008, compared to a decrease of eight basis points in 2007 and 16 basis points in 2006.
interest income in 2007 was due to loan growth, which was partially offset by a decline in noninterest-bearing deposits (primarily in the Financial Services Division) and competitive environments for both loan and deposit pricing. The decrease in net interest margin (FTE) was due to loan growth, a competitive loan and deposit pricing environment and changes in the funding mix, including a continued shift in funding sources toward higher-cost funds. Partially offsetting these decreases were maturities of interest rate swaps that carried negative spreads, which provided a 10 basis point improvement to the net interest margin in 2007, compared to 2006. Average earning assets increased $2.4 billion, or five percent, to $54.7 billion in 2007, compared to 2006, primarily as a result of a $2.1 billion increase in average loans and a $455 million increase in average investment securities available-for-sale. Average Financial Services Division loans (primarily low-rate) decreased $1.0 billion, and average Financial Services Division noninterest-bearing deposits decreased $1.5 billion in 2007, compared to 2006. Management expects average full-year 2009 net interest margin pressure will continue. Management anticipates no change in the Federal Funds rate. Management also expects continued improvement in loan spreads, challenging deposit pricing and demand deposits that provide less value in a historically low interest rate environment. The provision for credit losses includes both the provision for loan losses and the provision for credit losses on lending-related commitments. The provision for loan losses reflects management's evaluation of the adequacy of the allowance for loan losses. The allowance for loan losses represents management's assessment of probable losses inherent in the Corporation's loan portfolio. The provision for credit losses on lending-related commitments, a component of "noninterest expenses" on the consolidated statements of income, reflects management's assessment of the adequacy of the allowance for credit losses on lending-related commitments. The allowance for credit losses on lending-related commitments, which is included in "accrued expenses and other liabilities" on the consolidated balance sheets, covers probable credit-related losses inherent in credit-related commitments, including letters of credit and financial guarantees. The Corporation performs an in-depth quarterly credit quality review to determine the adequacy of both allowances. For a further discussion of both the allowance for loan losses and the allowance for credit losses on lending-related commitments, refer to the "Credit Risk" and the "Critical Accounting Policies" sections of this financial review. 2006, was primarily the result of challenges in the residential real estate development business in Michigan and California and a leveling off of overall credit quality improvement trends in the Texas market and the remaining businesses of the Western market. The provision for credit losses on lending-related commitments was a charge of $18 million in 2008, compared to a negative provision of $1 million and charge of $5 million in 2007 and 2006, respectively. The $19 million increase in the provision for credit losses on lending-related commitments in 2008 was primarily the result of an increase in specific reserves related to unused commitments extended to customers in the Michigan Commercial Real Estate business line and California and residential real estate development business and standby letters of credit extended to customers in the Michigan commercial real estate industry. The decrease in 2007 was primarily the result of a decrease in specific reserves related to unused commitments extended to two large customers in the automotive industry. These reserves declined due to sales of commitments and improved market values for the remaining commitments. An analysis of the changes in the allowance for credit losses on lending-related commitments is presented in the "Credit Risk" section of this financial review. Net loan charge-offs in 2008 were $471 million, or 0.91 percent of average total loans, compared to $149 million, or 0.30 percent, in 2007 and $60 million, or 0.13 percent, in 2006. The net loan charge-offs incurred in 2008 were relatively consistent in each quarter. The $322 million increase from 2007 resulted primarily from increases in Western residential real estate development ($171 million), included in the Commercial Real Estate line of business, Middle Market lending ($37 million) and Small Business lending ($26 million). Total net credit-related charge-offs, which includes net charge-offs on both loans and lending-related commitments, were $472 million, or 0.91 percent of average total loans, in 2008, compared to $153 million, or 0.31 percent, in 2007 and $72 million, or 0.15 percent, in 2006. Of the $319 million increase in net credit-related charge-offs in 2008, compared to 2007, net credit-related charge-offs in the Business Bank business segment increased $275 million. By geographic market, net credit-related charge-offs in the Western and Midwest markets increased $213 million and $42 million, respectively, in 2008, compared to 2007. Excluding Commercial Real Estate, net credit-related charge-offs were $206 million, or 0.46 percent of average loans in 2008. An analysis of the changes in the allowance for loan losses, including charge-offs and recoveries by loan category, is presented in Table 8 of this financial review. An analysis of the changes in the allowance for credit losses on lending-related commitments is presented in the "Credit Risk" section of this financial review. Based on no significant further deterioration of the economic environment, management expects full-year 2009 net credit-related charge-offs to remain consistent with full-year 2008. The provision for credit losses is expected to exceed net charge-offs in 2009. Noninterest income increased $5 million, or less than one percent, to $893 million in 2008, compared to $888 million in 2007, and increased $33 million, or four percent, in 2007, compared to $855 million in 2006. Excluding net securities gains, net gain (loss) on sales of businesses and income from lawsuit settlement, noninterest income decreased six percent in 2008, compared to 2007, and increased seven percent in 2007, compared to 2006. An analysis of increases and decreases by individual line item is presented below. Service charges on deposit accounts increased $8 million, or three percent, to $229 million in 2008, compared to $221 million in 2007, and increased $3 million, or one percent, in 2007, compared to $218 million in 2006. The increase in 2008 was primarily due to lower earnings credit allowances provided to business customers as a result of the interest rate environment. Fiduciary income of $199 million was unchanged in 2008, compared to 2007, and increased $19 million, or 11 percent, in 2007, compared to $180 million in 2006. Personal and institutional trust fees are the two major components of fiduciary income. These fees are based on services provided and assets managed. Fluctuations in the market values of the underlying assets managed, which include both equity and fixed income securities, impact fiduciary income. In 2008, lower fees related to the market decline were offset by net new business. The increase in 2007 was due to net new business and market appreciation. Commercial lending fees decreased $6 million, or eight percent, in 2008, compared to an increase of $10 million, or 16 percent, in 2007. The majority of the decrease in 2008 resulted from lower participation fees and lower unused commercial loan commitments. The increase in 2007 was primarily due to higher unused commercial loan commitments and participation fees. Letter of credit fees increased $6 million, or 10 percent, in 2008, compared to a decrease of $1 million, or two percent, in 2007. The increase in 2008 was principally due to one-time adjustments related to the timing of recognition of letter of credit fees. The decrease in 2007 was principally due to competitive pricing pressures and lower demand resulting from the recent challenges in the residential real estate market. Card fees, which consist primarily of interchange fees earned on debit and commercial cards, increased $4 million, or nine percent, to $58 million in 2008, compared to $54 million in 2007, and increased $8 million, or 16 percent, in 2007, compared to $46 million in 2006. Growth in both 2008 and 2007 resulted primarily from an increase in transaction volume caused by the continued shift to electronic banking, new customer accounts and new products. Brokerage fees of $42 million decreased $1 million, or three percent, in 2008, compared to $43 million and $40 million in 2007 and 2006, respectively. Brokerage fees include commissions from retail broker transactions and mutual fund sales and are subject to changes in the level of market activity. The decrease in 2008 was primarily due to lower transaction volumes as a result of strained market conditions. The increase in 2007 was primarily due to increased customer investments in money market mutual funds. Foreign exchange income of $40 million was unchanged in 2008, compared to 2007, and increased $2 million in 2007, compared to 2006. The increase in 2007 was primarily due to the impact of exchange rate changes on the Canadian dollar denominated net assets held at the Corporation's Canadian branch. Bank-owned life insurance income increased $2 million, to $38 million in 2008, compared to a decrease of $4 million, to $36 million in 2007. The increase in 2008 resulted primarily from an increase in death benefits received. The decrease in 2007 resulted primarily from decreases in death benefits received and earnings. Net securities gains increased $60 million to $67 million in 2008, compared to $7 million in 2007 and a minimal amount in 2006. Included in 2008 were gains on the sales of the Corporation's ownership of Visa ($48 million) and MasterCard shares ($14 million). There were no individually significant gains in 2007 and 2006. The net gain on sales of businesses in 2007 included a net gain of $1 million on the sale of an insurance subsidiary and a $2 million adjustment to reduce the loss on the 2006 sale of the Corporation's Mexican bank charter, while 2006 included a net loss of $12 million on the sale of the Mexican bank charter. The income from lawsuit settlement of $47 million in 2006 resulted from a payment received to settle a Financial Services Division-related lawsuit. Other noninterest income decreased $65 million, or 45 percent, in 2008, compared to an increase of $18 million, or 15 percent, in 2007. The following table illustrates fluctuations in certain categories included in "other noninterest income" on the consolidated statements of income. Compensation deferred by the Corporation's officers is invested in stocks and bonds to reflect the investment selections of the officers. Income (loss) on these assets is reported in noninterest income and the offsetting increase (decrease) in the liability is reported in salaries expense. Noninterest expenses increased $60 million, or four percent, to $1,751 million in 2008, compared to $1,691 million in 2007, and increased $17 million, or one percent, in 2007, from $1,674 million in 2006. Excluding an $88 million net charge related to the repurchase of auction-rate securities from certain customers in 2008, noninterest expenses decreased $28 million, or two percent, in 2008, compared to 2007, largely due to decreases in salaries, excluding severance ($88 million) which included a decrease in deferred compensation plan costs ($33 million), and customer services expense ($30 million), partially offset by increases in severance-related expenses ($30 million), the provision for credit losses on lending-related commitments ($19 million) and net occupancy expense ($18 million). An analysis of increases and decreases by individual line item is presented below. ($8 million), partially offset by an increase in severance expense ($25 million). The decrease in deferred compensation plan costs were offset by decreased deferred compensation asset returns in noninterest income. The decrease in regular salaries in 2008 was primarily the result of the refinement in the application of SFAS 91 ($44 million), as described in Note 1 to the consolidated financial statements, and a decrease in staff size of approximately 600 full-time equivalent employees from year-end 2007 to year-end 2008. Partially offsetting the decreases in regular salaries in 2008 was annual merit increases of approximately $16 million. The $25 million increase in severance expense reflected staff reduction efforts in the fourth quarter of 2008, primarily in response to deteriorating economic conditions. The increase in 2007 was primarily due to increases in regular salaries of $16 million and incentive compensation of $4 million. The increase in regular salaries in 2007 was primarily the result of annual merit increases of approximately $18 million, partially offset by a decline in contract labor costs associated with technology-related projects. In addition, staff size increased approximately 80 full-time equivalent employees from year-end 2006 to year-end 2007, including approximately 140 full-time equivalent employees added in new banking centers. Employee benefits expense increased $1 million, or one percent, in 2008, compared to an increase of $9 million, or five percent, in 2007. An increase in staff insurance costs and severance related benefits in 2008, when compared to 2007, was substantially offset by a decline in pension expense. The increase in 2007 resulted primarily from an increase in defined contribution plan expense, mostly from a change in the Corporation's core matching contribution rate effective January 1, 2007. For a further discussion of pension and defined contribution plan expense, refer to the "Critical Accounting Policies" section of this financial review and Note 16 to the consolidated financial statements. Net occupancy and equipment expense increased $20 million, or 10 percent, to $218 million in 2008, compared to an increase of $18 million, or 10 percent, in 2007. Net occupancy and equipment expense increased $11 million and $9 million in 2008 and 2007, respectively, due to the addition of 28 new banking centers in 2008, 30 in 2007 and 25 in 2006. Outside processing fee expense increased $13 million, or 13 percent, to $104 million in 2008, from $91 million in 2007, compared to an increase of $6 million, or seven percent, in 2007. The increases in 2008 and 2007 are from higher volume in activity-based processing charges, in part related to outsourcing. Software expense increased $13 million, or 21 percent, in 2008, compared to an increase of $7 million, or 12 percent in 2007. The increases in both 2008 and 2007 were primarily due to increased investments in technology, including banking center and treasury management sales tracking tools, anti-money laundering initiatives, transition from paper to electronic check processing and the continued development of loan portfolio and enterprise level analytical tools, combined with an increase in both amortization and maintenance costs. Customer services expense decreased $30 million, or 69 percent, to $13 million in 2008, from $43 million in 2007, and decreased $4 million, or seven percent, in 2007, from $47 million in 2006. Customer services expense represents certain expenses paid on behalf of particular customers, and is one method to attract and retain title and escrow deposits in the Financial Services Division. The amount of customer services expense varies from period to period as a result of changes in the level of noninterest-bearing deposits and low-rate loans in the Financial Services Division and the earnings credit allowances provided on these deposits, as well as, a competitive environment. Policies" section of this financial review and Note 28 to the consolidated financial statements. The increase in 2007 reflected the $13 million Visa loss sharing expense discussed above partially offset by a litigation-related insurance settlement of $8 million received in 2007. The provision for credit losses on lending-related commitments increased $19 million to $18 million in 2008, from a negative provision of $1 million in 2007, and decreased $6 million in 2007, compared to a provision of $5 million in 2006. For additional information on the provision for credit losses on lending-related commitments, refer to Notes 1 and 20 to the consolidated financial statements, respectively, and the "Provision for Credit Losses" section of this financial review. Other noninterest expenses increased $2 million, or one percent, in 2008, compared to a decrease of $41 million, or 14 percent, in 2007. The increase in 2008, compared to 2007, resulted primarily from an $11 million increase in Federal Deposit Insurance Corporation (FDIC) insurance. The decrease in 2007 was primarily the result of the prospective change in classification of interest on income tax liabilities to "provision for income taxes" in 2007. The following table illustrates the fluctuations in certain categories included in "other noninterest expenses" on the consolidated statements of income. Management expects a mid single-digit decrease in noninterest expenses in 2009 compared to 2008 levels, due to control of discretionary expenses and workforce. The provision for income taxes was $59 million in 2008, compared to $306 million in 2007 and $345 million in 2006. The provision for income taxes in 2008 reflected the impact of lower pre-tax income and included a net after-tax charge of $9 million related to the acceptance of a global settlement offered by the IRS on certain structured leasing transactions, settlement with the IRS on disallowed foreign tax credits related to a series of loans to foreign borrowers and other tax adjustments. The provision for income taxes in 2007 included a $9 million reduction ($6 million after-tax) of interest resulting from a settlement with the Internal Revenue Service (IRS) on a refund claim. The effective tax rate, computed by dividing the provision for income taxes by income from continuing operations before income taxes, was 21.7 percent in 2008, 31.0 percent in 2007 and 30.6 percent in 2006. Changes in the effective tax rate in 2008 from 2007, and 2007 from 2006, are disclosed in Note 17 to these consolidated financial statements. The Corporation had a net deferred tax asset of $29 million at December 31, 2008. Included in net deferred taxes at December 31, 2008 were deferred tax assets of $625 million, net of a $1 million valuation allowance established for certain state deferred tax assets. A valuation allowance is provided when it is "more-likely-than-not" that some portion of the deferred tax asset will not be realized. Deferred tax assets are evaluated for realization based on available evidence and assumptions made regarding future events. In the event that the future taxable income does not occur in the manner anticipated, other initiatives could be undertaken to preclude the need to recognize a valuation allowance against the deferred tax asset. January 1, 2007, accounted for as a change in accounting principle via a decrease to the opening balance of retained earnings ($13 million after-tax). For further discussion of FIN 48, refer to Note 17 to these consolidated financial statements. Income from discontinued operations, net of tax, was $1 million in 2008, compared to $4 million in 2007 and $111 million in 2006. Income from discontinued operations in 2008 reflected income accrued on a contingent note related to the sale of Munder in 2006. 2008 and 2007 also included adjustments to the initial gain recorded on the sale of Munder in 2006. For further information on the sale of Munder and discontinued operations, refer to Note 27 to the consolidated financial statements. In the fourth quarter 2008, the Corporation participated in the U.S. Department of Treasury (U.S. Treasury) Capital Purchase Program (the Purchase Program) and received proceeds of $2.25 billion from the U.S. Treasury. In return, the Corporation issued 2.25 million shares of Fixed Rate Cumulative Perpetual Preferred Stock, Series F, without par value (preferred shares) and granted a warrant to purchase 11.5 million shares of common stock to the U.S. Treasury. The preferred shares pay a cumulative dividend rate of five percent per annum on the liquidation preference of $1,000 per share through November 2013, and a rate of nine percent per annum thereafter. The proceeds from the Purchase Program were allocated between the preferred shares and the related warrant based on relative fair value, which resulted in an initial carrying value of $2.1 billion for the preferred shares and $124 million for the warrant. The resulting discount to the preferred shares of $124 million will accrete on a level yield basis over five years through November 2013 and is being recognized as additional preferred stock dividends. Preferred stock dividends, including the accretion of the discount, were $17 million for the fourth quarter and the year ended December 31, 2008. Preferred stock dividends are expected to be approximately $33 million for the first quarter 2009 and $134 million for the full-year 2009. For further information on the Purchase Program, refer to the "Capital" section of this financial review and Note 12 to the consolidated financial statements. The Corporation's operations are strategically aligned into three major business segments: the Business Bank, the Retail Bank and Wealth & Institutional Management. These business segments are differentiated based upon the products and services provided. In addition to the three major business segments, the Finance Division is also reported as a segment. The Other category includes discontinued operations and items not directly associated with these business segments or the Finance Division. Note 24 to the consolidated financial statements describes the business activities of each business segment and the methodologies which form the basis for these results, and presents financial results of these business segments for the years ended December 31, 2008, 2007 and 2006.
compensation, were offset by increases in allocated net corporate overhead expenses ($21 million) and the provision for credit losses on lending-related commitments ($13 million), legal fees ($5 million), and nominal increases in several other expense categories. The corporate overhead allocation rates used were approximately 6.3 percent and 5.5 percent in 2008 and 2007, respectively. The increase in rate in 2008, when compared to 2007, resulting primarily from a change in the allocation of funding credits and an increase in expenses not assigned directly to the segments. The Retail Bank's net income decreased $94 million, or 74 percent, to $34 million in 2008, compared to a decrease of $51 million, or 28 percent, to $128 million in 2007. Net interest income (FTE) of $566 million decreased $104 million, or 16 percent, in 2008, primarily due to a decline in deposit spreads caused by a competitive pricing environment, partially offset by the benefit of a $208 million increase in average loans. The provision for loan losses increased $82 million in 2008, primarily due to increases in reserves for the Small Business and home equity loan portfolios. Noninterest income of $258 million increased $38 million in 2008, from $220 million in 2007, primarily due to a $48 million gain on the sale of Visa shares in 2008, partially offset by a $9 million decline in net gains from the sale of Small Business loans. Noninterest expenses of $645 million in 2008 decreased $9 million from 2007, primarily due to the first quarter 2008 reversal of a $13 million Visa loss sharing expense recognized in 2007 and a $9 million decrease in salaries, including a $21 million decrease from the refinement in the application of SFAS 91, as described in Note 1 to the consolidated financial statements, partially offset by increases in net occupancy expense ($11 million), resulting primarily from new banking centers, allocated net corporate overhead expenses ($4 million) and FDIC expense ($4 million). Refer to the Business Bank discussion above for an explanation of the increase in allocated net corporate overhead expenses. The Corporation opened 28 new banking centers in 2008 and 30 new banking centers in 2007, resulting in a $20 million increase in noninterest expenses in 2008, compared to 2007. Wealth & Institutional Management's net income decreased $74 million to a net loss of $4 million in 2008, compared to an increase of $9 million, or 15 percent, to $70 million in 2007. Net interest income (FTE) of $148 million increased $3 million, or two percent, in 2008, compared to 2007, due to a $605 million increase in average loans from 2007, partially offset by decreases in loan and deposit spreads. Loan spreads improved in the second half of 2008, particularly in the fourth quarter. The provision for loan losses increased $28 million, primarily due to an increase in reserves for the Private Banking loan portfolio. Noninterest income of $292 million increased $9 million, or three percent, in 2008, primarily due to increases in net securities gains ($4 million) and insurance commission income ($3 million). Noninterest expenses of $422 million in 2008 increased $100 million from 2007, primarily due to an $88 million net charge in 2008 related to the offer to repurchase, at par, auction-rate securities, as described in Note 28 to the consolidated financial statements, and an increase in allocated net corporate overhead expenses ($4 million), partially offset by a $7 million reduction in salaries from the refinement in the application of SFAS 91, as described in Note 1 to the consolidated financial statements. Refer to the Business Bank discussion above for an explanation of the increase in allocated net corporate overhead expenses. The net loss in the Finance Division was $48 million in 2008, compared to a net loss of $38 million in 2007. Contributing to the $10 million increase in net loss was a $14 million decrease in net interest income (FTE), primarily due to the declining rate environment in which income received from the lending-related business units decreased faster than the longer-term value attributed to deposits generated by the business units, partially offset by an increase in investment securities available-for-sale. Net loss in the Other category was $6 million for 2008, compared to net income of $10 million for 2007, largely due to a $23 million decrease in net income from principal investing and warrants. The remaining difference is due to timing differences between when corporate overhead expenses are reflected as a consolidated expense and when the expenses are allocated to the business segments. The Corporation's management accounting system also produces market segment results for the Corporation's four primary geographic markets: Midwest, Western, Texas and Florida. In addition to the four primary geographic markets, Other Markets and International are also reported as market segments. The Finance & Other Businesses category includes discontinued operations and items not directly associated with the market segments. Note 25 to the consolidated financial statements presents a description of each of these market segments as well as the financial results for the years ended December 31, 2008, 2007 and 2006. The Midwest market's net income decreased $85 million, or 29 percent, to $210 million in 2008, compared to a decrease of $44 million, or 13 percent, to $295 million in 2007. Net interest income (FTE) of $776 million decreased $112 million from 2007, primarily due to $38 million of tax-related non-cash charges to income related to certain structured leasing transactions and a decline in deposit spreads caused by a competitive deposit pricing environment, partially offset by increases in average loan and deposit balances. Excluding the tax-related non-cash charges to income, loan spreads improved in the second half of 2008, particularly in the fourth quarter. The provision for loan losses increased $67 million in 2008, compared to 2007, primarily due to increases in reserves for the Middle Market, Small Business and Global Corporate loan portfolios, partially offset by lower reserves for the residential real estate development portfolio in 2008, compared to 2007. Noninterest income of $524 million in 2008 increased $53 million from 2007, primarily due to gains of $39 million on the sale of Visa shares and $14 million on the sale of MasterCard shares in 2008, and an increase in letter of credit fees ($6 million). Noninterest expenses of $808 million in 2008 decreased $10 million from 2007, primarily due to the first quarter 2008 reversal of a $10 million Visa loss sharing expense recognized in 2007 and a $31 million decrease in salaries, including a $28 million decrease from the refinement in the application of SFAS 91, as described in Note 1 to the consolidated financial statements, partially offset by a $9 million increase in allocated net corporate overhead expenses, a $9 million increase in provision for credit losses on lending-related commitments, a $4 million increase in FDIC expense and nominal increases in several other expense categories. Refer to the Business Bank discussion above for an explanation of the increase in allocated net corporate overhead expenses. decline in deposit spreads caused by a competitive deposit pricing environment and a decline in loan spreads (excluding the Financial Services Division), partially offset by the reduced negative impact of the Financial Services Division (see Footnote (2) to Table 2) and an $841 million increase in average loans, excluding the Financial Services Division. Average low-rate Financial Services Division loan balances declined $820 million in 2008 and average Financial Services Division deposits declined $1.5 billion. Loan spreads improved in the second half of 2008, particularly in the fourth quarter. The provision for loan losses increased $271 million, to $379 million in 2008, from $108 million in 2007, primarily due to increases in reserves for the residential real estate development business and the Middle Market and Small Business loan portfolios in 2008, compared to 2007. Net credit-related charge-offs increased $213 million, largely due to an increase in charge-offs in the residential real estate development business. Noninterest income was $139 million in 2008, an increase of $9 million from 2007, primarily due to a $7 million increase in service charges on deposits and a $5 million increase in foreign exchange income, partially offset by a $6 million decline in net gains from the sale of Small Business loans. Noninterest expenses of $448 million in 2008 decreased $6 million from 2007, primarily due to a $30 million decrease in customer services expense, and a $9 million decrease in salaries, resulting from the refinement in the application of SFAS 91, as described in Note 1 to the consolidated financial statements, partially offset by increases in allocated net corporate overhead expenses ($11 million) and net occupancy expense ($7 million), resulting primarily from new banking centers, and nominal increases in several other expense categories. Refer to the Business Bank discussion above for an explanation of the increase in allocated net corporate overhead expenses. The Corporation opened 18 new banking centers in the Western market in 2008, resulting in a $14 million increase in noninterest expenses in 2008, compared to 2007. The Texas market's net income decreased $32 million, or 37 percent, to $53 million in 2008, compared to $85 million in both 2007 and 2006. Net interest income (FTE) of $292 million increased $5 million, or two percent, in 2008, compared to 2007. The increase in net interest income (FTE) was primarily due to increases of $949 million and $139 million in average loan and deposit balances, respectively, partially offset by declines in loan and deposit spreads. Loan spreads improved in the second half of 2008, particularly in the fourth quarter. The provision for loan losses increased $43 million, primarily due to increases in reserves for the Small Business, Middle Market, Energy and Commercial Real Estate loan portfolios in 2008, compared to 2007. Noninterest income of $94 million in 2008 increased $8 million from 2007, primarily due to a $7 million gain on the sale of Visa shares. Noninterest expenses of $246 million in 2008 increased $11 million from 2007, primarily due to increases in allocated net corporate overhead expenses ($5 million), net occupancy expense ($4 million), resulting primarily from new banking centers, and nominal increases in several other expense categories, partially offset by a $3 million decrease in salaries, resulting from a $5 million decrease from the refinement in the application of SFAS 91, as described in Note 1 to the consolidated financial statements. Refer to the Business Bank discussion above for an explanation of the increase in allocated net corporate overhead expenses. The Corporation opened 9 new banking centers in the Texas market in 2008, which resulted in a $6 million increase in noninterest expenses. The Florida market's net income decreased $21 million to a net loss of $14 million in 2008, compared to a decrease of $6 million, to net income of $7 million in 2007. Net interest income (FTE) of $47 million in 2008 increased $1 million, or one percent, from 2007, primarily due to a $220 million increase in average loan balances. The provision for loan losses increased $29 million, primarily due to increases in reserves for the Middle Market and Private Banking loan portfolios. Noninterest income of $16 million in 2008 increased $2 million from 2007. Noninterest expenses of $43 million in 2008 increased $5 million from 2007, due to nominal increases in several expense categories. compared to 2007, primarily due to a decrease in net income from principal investing and warrants. Noninterest expenses of $190 million in 2008 increased $94 million from 2007, primarily due to the $88 million net charge related to the repurchase of auction rate securities discussed above and an increase in allocated net corporate overhead expenses ($3 million). Refer to the Business Bank discussion above for an explanation of the increase in allocated net corporate overhead expenses. The International market's net income decreased $21 million, to $29 million in 2008, compared to an increase of $17 million to $50 million in 2007. Net interest income (FTE) of $61 million in 2008 decreased $7 million from 2007, primarily due to a decrease in average deposit balances, partially offset by an increase in average loan balances. The provision for loan losses of $4 million in 2008 increased $19 million from a negative provision of $15 million in 2007, primarily due to high loan loss recoveries in 2007. Noninterest income of $31 million in 2008 decreased $7 million from 2007, primarily due to net securities gains of $4 million in 2007. Noninterest expenses of $41 million decreased $3 million in 2008 compared to 2007, due to nominal decreases in several expense categories. The net loss for the Finance & Other Business segment was $54 million in 2008, compared to a net loss of $28 million in 2007. The $26 million increase in net loss resulted from the same reasons noted in the Finance Division and Other category discussions under the "Business Segments" heading above. The following table lists the Corporation's banking centers by geographic market segments. Total assets were $67.5 billion at December 31, 2008, an increase of $5.2 billion from $62.3 billion at December 31, 2007. On an average basis, total assets increased $6.6 billion to $65.2 billion in 2008, from $58.6 billion in 2007, resulting primarily from a $5.7 billion increase in average earning assets, largely investment securities available-for-sale ($3.7 billion) and loans ($1.9 billion). Also, on an average basis, medium- and long-term debt increased $4.3 billion, short-term borrowings increased $1.7 billion, and interest-bearing deposits increased $733 million in 2008, compared to 2007. Includes demand loans, loans having no stated repayment schedule or maturity and overdrafts. Total earning assets increased $5.0 billion, or nine percent, to $62.4 billion at December 31, 2008, from $57.4 billion at December 31, 2007. The Corporation's average earning assets balances are reflected in Table 2 of this financial review. Financial Services Division loans are primarily low-rate. Total loans were $50.5 billion at December 31, 2008, a decrease of $238 million from $50.7 billion at December 31, 2007. As shown in the tables above, total average loans grew $1.9 billion, or four percent, to $51.8 billion in 2008, compared to 2007, with growth in most business lines and growth in all markets from 2007 to 2008. Excluding Financial Services Division loans, average loans grew $2.8 billion, or six percent. loans are loans where the primary collateral is a lien on any real property. Real property is generally considered primary collateral if the value of that collateral represents more than 50 percent of the commitment at loan approval. Average loans to borrowers in the Commercial Real Estate business line, which include loans to residential real estate developers, represented $5.6 billion, or 37 percent, of average total commercial real estate loans in 2008, compared to $5.2 billion, or 36 percent, of average total commercial real estate loans in 2007. The increase in average commercial real estate loans to borrowers in the Commercial Real Estate business line in 2008 largely included draws on previously approved lines of credit for residential real estate and commercial development projects. The remaining $9.5 billion and $9.1 billion of commercial real estate loans in other business lines in 2008 and 2007, respectively, were primarily owner-occupied commercial mortgages. In addition to the $15.1 billion of average 2008 commercial real estate loans discussed above, the Commercial Real Estate business line also had $1.4 billion of average 2008 loans not classified as commercial real estate on the consolidated balance sheet. Refer to the "Commercial Real Estate Lending" portion of the "Risk Management" section of this financial review for more information. Average residential mortgage loans increased $72 million, or four percent, in 2008, from 2007, and primarily include mortgages originated and retained for certain relationship customers. Average home equity loans increased $89 million, or six percent, in 2008, from 2007, as a result of an increase in draws on new and existing commitments extended. Auction-rate preferred securities totaling $936 million have no contractual maturity and are excluded from weighted average maturity. Investment securities available-for-sale increased $2.9 billion to $9.2 billion at December 31, 2008, from $6.3 billion at December 31, 2007. Average investment securities available-for-sale increased $3.7 billion to $8.1 billion in 2008, compared to $4.4 billion in 2007, primarily due to the purchase of approximately $2.9 billion of AAA-rated mortgage-backed securities issued by government sponsored entities (FNMA, FHLMC) and the purchase of $1.3 billion of auction-rate securities from certain customers in 2008. The increase in Government-sponsored enterprise securities resulted from balance sheet management decisions to reduce interest rate sensitivity. Average other securities increased $182 million to $313 million in 2008, and consisted largely of money market and other fund investments at December 31, 2008. The purchase of auction-rate securities in 2008 resulted from the Corporation's September 2008 offer to repurchase, at par, auction-rate securities held by certain retail and institutional clients that were purchased through Comerica Securities, a broker/dealer subsidiary of Comerica Bank (the Bank). As of December 31, 2008, the Corporation's auction-rate securities portfolio was carried at an estimated fair value of $1.1 billion and consisted of non-taxable preferred ($584 million), taxable preferred ($352 million), student loan ($147 million) and state and municipal ($64 million) auction-rate securities. Subsequent to repurchase, auction-rate securities totaling $80 million, primarily taxable and non-taxable auction-rate preferred securities, were called or redeemed at par in the fourth quarter 2008 resulting in net securities gains of $4 million. The Corporation has experienced no credit-related losses or defaults on contractual interest payments related to the portfolio, however, these securities are currently in a less liquid market. For additional information on the repurchase of auction-rate securities, refer to the "Critical Accounting Policies" section of this financial review and Notes 23 and 28 to the consolidated financial statements. Short-term investments include federal funds sold and securities purchased under agreements to resell, interest-bearing deposits with banks and other short-term investments. Federal funds sold offer supplemental earnings opportunities and serve correspondent banks. Average federal funds sold and securities purchased under agreements to resell decreased $71 million to $93 million during 2008, compared to 2007. Interest-bearing deposits with banks are investments with banks in developed countries or international banking facilities of foreign banks located in the United States and included deposits with the Federal Reserve Bank since October 1, 2008, the date at which the Federal Reserve began paying interest on such balances. Interest-bearing deposits with banks on average increased $204 million to $219 million compared to 2007, primarily due to large deposits at the Federal Reserve Bank in the fourth quarter 2008. At December 31, 2008, interest-bearing deposits with the Federal Reserve Bank totaled $2.3 billion. Other short-term investments include trading securities and loans held-for-sale. Loans held-for-sale typically represent residential mortgage loans and Small Business Administration loans that have been originated and which management has decided to sell. Average other short-term investments increased $3 million to $244 million during 2008, compared to 2007. Short-term investments, other than loans held-for-sale, provide a range of maturities less than one year and are mostly used to manage short-term investment requirements of the Corporation. International assets are subject to general risks inherent in the conduct of business in foreign countries, including economic uncertainties and each foreign government's regulations. Risk management practices minimize the risk inherent in international lending arrangements. These practices include structuring bilateral agreements or participating in bank facilities, which secure repayment from sources external to the borrower's country. Accordingly, such international outstandings are excluded from the cross-border risk of that country. Mexico, with cross-border outstandings of $883 million, or 1.31 percent of total assets at December 31, 2008, was the only country with outstandings exceeding 1.00 percent of total assets at year-end 2008. There were no countries with cross-border outstandings between 0.75 and 1.00 percent of total assets at year-end 2008. Additional information on the Corporation's Mexican cross-border risk is provided in Table 7 above. Average deposits were $42.0 billion during 2008, an increase of $69 million, or less than one percent, from 2007. Excluding the Financial Services Division, average deposits increased $1.5 billion, or four percent, from 2007. Average core deposits declined $938 million, or three percent (increased $500 million or two percent excluding Financial Services Division deposits). Average other time deposits increased $1.2 billion and average foreign office time deposits decreased $145 million. Other time deposits represent certificates of deposit issued to institutional investors in denominations in excess of $100,000 and to retail customers in denominations of less than $100,000 through brokers, and are an alternative to other sources of purchased funds. Excluding the Financial Services Division, average noninterest-bearing deposits increased $529 million, or six percent, from 2007. Average Financial Services Division noninterest-bearing deposits declined $1.2 billion, or 42 percent, from 2007, due to reduced home prices, as well as, lower home mortgage financing and refinancing activity. Financial Services Division deposit levels may change with the direction of mortgage activity changes, and the desirability of and competition for such deposits. Average short-term borrowings increased $1.7 billion, to $3.8 billion in 2008, compared to $2.1 billion in 2007, primarily due to borrowings under the Federal Reserve Term Auction Facility (TAF). The TAF provides access to short-term funds at generally favorable rates. Short-term borrowings include federal funds purchased, securities sold under agreements to repurchase, TAF borrowings and treasury tax and loan notes. funding collateralized by mortgage-related assets to its members at generally favorable rates. Further information on medium- and long-term debt is provided in Note 11 to the consolidated financial statements. In the fourth quarter 2008, the Corporation elected to participate in the Temporary Liquidity Guarantee Program (The TLG Program) announced by the FDIC in October 2008. Under the TLG Program, up to $5.2 billion of senior unsecured debt issued by the Bank between October 14, 2008 and June 30, 2009 with a maturity of more than 30 days is eligible to be guaranteed by the FDIC. Debt guaranteed by the FDIC is backed by the full faith and credit of the United States. The guarantee expires at the earlier of the maturity date of the issued debt or June 30, 2012. All senior unsecured debt issued under the TLG Program will be subject to an annualized fee ranging from 50 basis points to 100 basis points of the amount of debt, based on maturity. At December 31, 2008, there was approximately $3 million of senior unsecured debt outstanding in the form of bank-to-bank deposits issued under the TLG Program. The TLG Program also provides unlimited FDIC insurance protection to all noninterest-bearing deposit transaction accounts, interest-bearing transaction accounts earning interest rates of 50 basis points or less, and Interest on Lawyers' Trust Accounts (IOLTA's) through December 31, 2009, regardless of the dollar amount. This unlimited coverage is in addition to the increased FDIC limits approved on October 3, 2008, which increased insurance coverage limits on all deposits from $100,000 to $250,000 per account and also expires at the end of 2009. An annualized surcharge of 10 basis points is applied to those insured accounts not covered under the increased deposit insurance limit of $250,000, in addition to the existing risk-based deposit insurance premium paid on those deposits. For further information on the TLG Program, see Note 11 to the consolidated financial statements. Further information on the change in accumulated other comprehensive income (loss) is provided in Note 13 to the consolidated financial statements. The Corporation declared common dividends totaling $348 million, or $2.31 per share, on net income applicable to common stock of $196 million. To preserve and enhance the Corporation's balance sheet strength in the current uncertain economic environment, the Corporation lowered the quarterly cash dividend rate by 50 percent, to $0.33 per share, in the fourth quarter of 2008, and further reduced the dividend to $0.05 per share in the first quarter of 2009. $2.25 billion from the issuance of 2.25 million shares of Fixed Rate Cumulative Perpetual Preferred Stock, Series F, (preferred shares) and a related warrant to the U.S. Treasury. In conjunction with the issuance of the preferred shares, the U.S. Treasury was granted a warrant to purchase 11.5 million shares of common stock at an exercise price of $29.40 per share. The impact of the warrant on diluted net income per common share for any given period is dependent upon the extent by which the average market price of the Corporation's common stock exceeds the exercise price of the underlying shares. As required by the Purchase Program, the Corporation adopted the U.S. Treasury's standards for executive compensation and corporate governance for the period during which the U.S. Treasury holds equity issued under the Purchase Program. These standards generally apply to the chief executive officer, chief financial officer, plus the three most highly compensated executive officers. In addition, the Corporation agreed not to deduct for tax purposes executive compensation in excess of $500,000 for each senior executive. Under the Purchase Program, the consent of the U.S. Treasury is required for any increase in common dividends declared from the dividend rate in effect at the time of investment (quarterly dividend rate of $0.33 per share) and for any common share repurchases (other than common share repurchases in connection with any benefit plan in the ordinary course of business), until November 2011, unless the preferred shares have been fully redeemed or the U.S. Treasury has transferred all the preferred shares to third parties prior to that date. In addition, all accrued and unpaid dividends on the preferred shares must be declared and the payment set aside for the benefit of the holders of the preferred shares before any dividend may be declared on the Corporation's common stock and before any shares of the Corporation's common stock may be repurchased in the open market. The issuance of the preferred shares and a related warrant increased the Corporation's Tier 1 risk-based capital ratio at December 31, 2008 by approximately 300 basis points. For further information on the Purchase Program, see Note 12 to the consolidated financial statements. The Corporation assesses capital adequacy against the risk inherent in the balance sheet, recognizing that unexpected loss is the common denominator of risk and that common equity has the greatest capacity to absorb unexpected loss. Based on an interim decision issued by the banking regulators in 2006, the after-tax charge associated with the impact of SFAS No. 158, "Employers' Accounting for Defined Benefit Pension and Other Postretirement Plans" on pension and post-retirement plan accounting was excluded from the calculation of regulatory capital ratios. Therefore, for the purposes of calculating regulatory capital ratios, shareholders' equity was increased by $470 million and $170 million on December 31, 2008 and 2007, respectively. Refer to Note 19 to the consolidated financial statements for further discussion of regulatory capital requirements and capital ratio calculations. When capital exceeds necessary levels, the Corporation's common stock can be repurchased as a way to return excess capital to shareholders. The Corporation made no share repurchases in the open market in 2008, compared to repurchases of 10.0 million shares in 2007 for $580 million and 6.6 million shares in 2006 for $383 million. At December 31, 2008, 12.6 million shares of Comerica Incorporated common stock remained available for repurchase under the Corporation's publicly announced repurchase program authorized by the Board of Directors of the Corporation (the Board). As discussed above, common share repurchases through November 2011 may require the consent of the U.S. Treasury under the terms of the Purchase Program. Refer to Note 12 to the consolidated financial statements for additional information on the Corporation's share repurchase program. At December 31, 2008, the Corporation and its U.S. banking subsidiaries exceeded the capital ratios required for an institution to be considered "well capitalized" by the standards developed under the Federal Deposit Insurance Corporation Improvement Act of 1991. The Corporation assumes various types of risk in the normal course of business. Management classifies the risk exposures into five areas: (1) credit, (2) market, (3) operational, (4) compliance and (5) business risks and considers credit risk as the most significant risk. The Corporation continues to enhance its risk management capabilities with additional processes, tools and systems designed to provide management with deeper insight into the Corporation's various risks, enhance the Corporation's ability to control those risks and ensure that appropriate compensation is received for the risks taken. Specialized risk managers, along with the risk management committees in credit, market and liquidity, operational and compliance are responsible for the day-to-day management of those respective risks. The Corporation's Enterprise-Wide Risk Management Committee is responsible for establishing the governance over the risk management process, as well as, providing oversight in managing the Corporation's aggregate risk position. The Enterprise-Wide Risk Management Committee is principally made up of the various managers from the different risk areas and business units and has reporting responsibility to the Enterprise Risk Committee of the Board. During 2008, the Corporation continued its focus on the credit components of the previously described enterprise-wide risk management processes. Enhancements to the analytics related to capital modeling, migration, credit loss forecasting, stress testing analysis and validation and testing continued in 2008.
each business loan at the time of approval and are subject to subsequent periodic reviews by the Corporation's senior management. The Corporation performs a detailed credit quality review quarterly on both large business and certain large consumer and residential mortgage loans that have deteriorated below certain levels of credit risk and may allocate a specific portion of the allowance to such loans based upon this review. The Corporation defines business loans as those belonging to the commercial, real estate construction, commercial mortgage, lease financing and international loan portfolios. A portion of the allowance is allocated to the remaining business loans by applying estimated loss ratios, based on numerous factors identified below, to the loans within each risk rating. In addition, a portion of the allowance is allocated to these remaining loans based on industry specific risks inherent in certain portfolios that have experienced above average losses, including portfolio exposures to Small Business loans, high technology companies and the retail trade (gasoline delivery) industry. Furthermore, a portion of the allowance is allocated to these remaining loans based on specific risks inherent in certain portfolios that have not yet manifested in the risk ratings, including portfolio exposure to the automotive industry. The portion of the allowance allocated to all other consumer and residential mortgage loans is determined by applying estimated loss ratios to various segments of the loan portfolio. Estimated loss ratios for all portfolios incorporate factors such as recent charge-off experience, current economic conditions and trends, and trends with respect to past due and nonaccrual amounts, and are supported by underlying analysis, including information on migration and loss given default studies from each of the three largest domestic geographic markets (Midwest, Western and Texas), as well as, mapping to bond tables. The allowance for credit losses on lending-related commitments, included in "accrued expenses and other liabilities" on the consolidated balance sheets, provides for probable credit losses inherent in lending-related commitments, including unused commitments to extend credit, letters of credit and financial guarantees. Lending-related commitments for which it is probable that the commitment will be drawn (or sold) are reserved with the same estimated loss rates as loans, or with specific reserves. In general, the probability of draw for letters of credit is considered certain once the credit becomes a watch list credit. Non-watch list letters of credit and all unfunded commitments have a lower probability of draw, to which standard loan loss rates are applied. Actual loss ratios experienced in the future may vary from those estimated. The uncertainty occurs because factors may exist which affect the determination of probable losses inherent in the loan portfolio and are not necessarily captured by the application of estimated loss ratios or identified industry specific risks. A portion of the allowance is maintained to capture these probable losses and reflects management's view that the allowance should recognize the margin for error inherent in the process of estimating expected loan losses. Factors that were considered in the evaluation of the adequacy of the Corporation's allowance include the inherent imprecision in the risk rating system and the risk associated with new customer relationships. The allowance associated with the margin for inherent imprecision covers probable loan losses as a result of an inaccuracy in assigning risk ratings or stale ratings which may not have been updated for recent negative trends in particular credits. The allowance due to new business migration risk is based on an evaluation of the risk of rating downgrades associated with loans that do not have a full year of payment history. The total allowance for loan losses is available to absorb losses from any segment within the portfolio. Unanticipated economic events, including political, economic and regulatory instability in countries where the Corporation has loans, could cause changes in the credit characteristics of the portfolio and result in an unanticipated increase in the allowance. Inclusion of other industry specific portfolio exposures in the allowance, as well as, significant increases in the current portfolio exposures, could also increase the amount of the allowance. Any of these events, or some combination thereof, may result in the need for additional provision for loan losses in order to maintain an allowance that complies with credit risk and accounting policies. The total allowance for loan losses was $770 million at December 31, 2008, compared to $557 million at December 31, 2007, an increase of $213 million. The increase resulted primarily from an increase in individual and industry reserves for customers in the residential real estate development business located in the Western market (primarily California). An analysis of the changes in the allowance for loan losses is presented in Table 8 of this financial review. The allowance for credit losses on lending-related commitments was $38 million at December 31, 2008, compared to $21 million at December 31, 2007, an increase of $17 million, resulting primarily from an increase in specific reserves related to unused commitments extended to customers in the Michigan Commercial Real Estate business line and California residential real estate development business and standby letters of credit extended to customers in the Michigan commercial real estate industry. An analysis of the changes in the allowance for credit losses on lending-related commitments is presented below. allowance coverage. The allowance for loan losses as a multiple of net loan charge-offs decreased to 1.6 times for the year ended December 31, 2008, compared to 3.7 times for the year ended December 31, 2007, as a result of higher levels of net loan charge-offs in 2008. Nonperforming assets include loans on nonaccrual status, loans which have been renegotiated to less than market rates due to a serious weakening of the borrower's financial condition and real estate which has been acquired through foreclosure and is awaiting disposition. Residential mortgage loans are generally placed on nonaccrual status during the foreclosure process, normally no later than 150 days past due. Other consumer loans are generally not placed on nonaccrual status and are charged off no later than 180 days past due, and earlier, if deemed uncollectible. Loans, other than consumer loans, are generally placed on nonaccrual status when management determines that principal or interest may not be fully collectible, but no later than 90 days past due on principal or interest, unless the loan is fully collateralized and in the process of collection. Loan amounts in excess of probable future cash collections are charged off to an amount that management ultimately expects to collect. Interest previously accrued but not collected on nonaccrual loans is charged against current income at the time the loan is placed on nonaccrual. Income on such loans is then recognized only to the extent that cash is received and where the future collection of principal is probable. Loans that have been restructured to yield a rate that was equal to or greater than the rate charged for new loans with comparable risk and have met the requirements for return to accrual status are not included in nonperforming assets. However, such loans may be required to be evaluated for impairment. Refer to Note 4 to the consolidated financial statements for a further discussion of impaired loans. Nonperforming assets increased $560 million to $983 million at December 31, 2008, from $423 million at December 31, 2007. Table 10 above shows changes in individual categories. The $526 million increase in nonaccrual loans at December 31, 2008 from year-end 2007 levels resulted primarily from increases of $267 million in nonaccrual real estate construction loans (primarily residential real estate development), $121 million in nonaccrual commercial mortgage loans and $47 million in foreclosed property. Loans past due 90 days or more and still on accrual status increased $71 million, to $125 million at December 31, 2008, from $54 million at December 31, 2007. At December 31, 2008, these loans included $59 million from the Western market Commercial Real Estate business line and $59 million from the Midwest market, primarily commercial and residential real estate development loans. Nonperforming assets as a percentage of total loans and foreclosed property was 1.94 percent and 0.83 percent at December 31, 2008 and 2007, respectively. Includes net changes related to nonaccrual loans with balances less than $2 million, payments on nonaccrual loans with book balances greater than $2 million and transfers of nonaccrual loans to foreclosed property. Excludes business loan gross charge-offs and nonaccrual business loans sold. The following table presents the number of nonaccrual loan relationships greater than $2 million and balance by size of relationship at December 31, 2008. There were 142 loan relationships each with balances greater than $2 million, totaling $1.1 billion that were transferred to nonaccrual status in 2008, an increase of $668 million, when compared to $455 million in 2007. Of the transfers to nonaccrual with balances greater than $2 million in 2008, $729 million were from the Commercial Real Estate business line, including $510 million located in the Western market, and $241 million were from the Middle market business line. There were 41 loan relationships, each greater than $10 million transferred to nonaccrual in 2008. These loans totaled $597 million, of which $388 million were to companies in the Commercial Real Estate business line, primarily residential real estate development. The Corporation sold $47 million of nonaccrual business loans in 2008, including $24 million to customers in the residential real estate development business in the Western market. The following table presents a summary of total internally classified watch list loans (generally consistent with regulatory defined special mention, substandard and doubtful loans) at December 31, 2008. Of the $5.7 billion of watch list loans at December 31, 2008, $2.7 billion, or 46 percent were in the Commercial Real Estate business line. Consistent with the increase in nonaccrual loans from December 31, 2007 to December 31, 2008, total watch list loans increased both in dollars and as a percentage of the total loan portfolio. The following table presents a summary of nonaccrual loans at December 31, 2008 and loan relationships transferred to nonaccrual and net loan charge-offs during the year ended December 31, 2008, based primarily on the SIC code industry categories. Consumer, excluding certain personal purpose, nonaccrual loans and net charge-offs are included in the "Other" category. The following table indicates the percentage of nonaccrual loan carrying value to contractual value, which exhibits the degree to which loans reported as nonaccrual have been partially charged-off. Loans to borrowers in the automotive industry represented the largest significant industry concentration at December 31, 2008 and 2007. Loans to automotive dealers and to borrowers involved with automotive production are reported as automotive, since management believes these loans have similar economic characteristics that might cause them to react similarly to changes in economic conditions. This aggregation involves the exercise of judgment. Included in automotive production are: (a) original equipment manufacturers and Tier 1 and Tier 2 suppliers that produce components used in vehicles and whose primary revenue source is automotive-related ("primary" defined as greater than 50%) and (b) other manufacturers that produce components used in vehicles and whose primary revenue source is automotive-related. Loans less than $1 million and loans recorded in the Small Business division were excluded from the definition. Foreign ownership consists of North American affiliates of foreign automakers and suppliers. At December 31, 2008, dealer loans, as shown in the table above, totaled $4.7 billion, of which approximately $3.0 billion, or 64 percent, were to foreign franchises, $1.2 billion, or 25 percent, were to domestic franchises and $499 million, or 11 percent, were to other. Other dealer loans include obligations where a primary franchise was indeterminable, such as loans to large public dealership consolidators, and rental car, leasing, heavy truck and recreation vehicle companies. Nonaccrual loans to automotive borrowers totaled $17 million, or approximately two percent of total nonaccrual loans at December 31, 2008. Total automotive net loan charge-offs were $6 million in 2008. The following table presents a summary of automotive net loan and credit-related charge-offs for the years ended December 31, 2008 and 2007. Primarily related to domestic-owned production companies. All other industry concentrations, as defined by management, individually represented less than 10 percent of total loans at December 31, 2008.
loan-to-value ratios for such loans. Commercial real estate loans, consisting of real estate construction and commercial mortgage loans, totaled $15.0 billion at December 31, 2008, of which $5.5 billion, or 36 percent, were to borrowers in the Commercial Real Estate business line and the remaining 64 percent was primarily owner-occupied commercial mortgage loans. Increased nonaccrual loans, reserves and net charge-offs in the Commercial Real Estate business line reflected challenges in the residential real estate development business in California and Michigan. The real estate construction loan portfolio contains loans primarily made to long-time customers with satisfactory completion experience. However, the unprecedented decline in California residential activity proved too difficult for many of the smaller developers. The real estate construction loan portfolio totaled $4.5 billion and included approximately 1,200 loans, of which 44 percent had balances less than $1 million at December 31, 2008. The commercial mortgage loan portfolio totaled $10.5 billion at December 31, 2008 and included approximately 8,800 loans, of which 73 percent had balances of less than $1 million. This total included $8.9 billion of primarily owner-occupied commercial mortgage loans. Corporation's real estate construction and commercial mortgage loans to borrowers in the Commercial Real Estate business line.